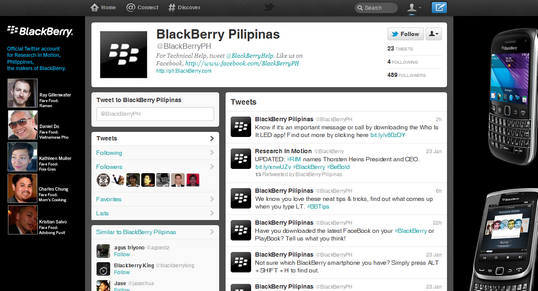 BlackBerry Philippines Twitter Account, Live! Follow 'em Now! Great news for BlackBerry fans in the Philippines who want to be able to talk to RIM directly at any time of the day regarding their concerns or simply to praise the brand for their great handsets! I've just received an email from Research in Motion's PR agency in the Philippines that BlackBerry Philippines' Twitter account is now live and ready to accept followers! We are starting the year of the Dragon with a huge roar! Hope you can also share this exciting piece of news on Twitter! So I checked the account earlier -- and it's live indeed! On the left side of the page, you'll see RIM's current roster of reps for the Philippines -- including Mr. Ray Gillenwater, Country Manager of RIM for the Philippines, whom TechPinas had an exclusive interview with during BlackBerry Developer Conference Asia held last month. If you're on Twitter, feel free follow BlackBerry Philippines here. And if you will, follow TechPinas as well via this link.